In the last update, we looked at Serena’s in-game sprite art. This time around, I’m going to introduce the other characters who appear in the Prologue chapter of the game. After that, we’ll have a look at some high resolution character artwork. Below are some incredibly brief descriptions of the main characters in the Prologue along with their sprite sketches. I say “sketches” because the final sprites will be 3d renders much like the ones in the last article. Serena has a rather unconventional family arrangement. She lives with her best friend and his family while her father is away on duty. Ken is Serena’s best friend. They do everything together, and they are no secrets between them. It’s summer vacation, so they are helping at the family store a lot. Ken has no problem speaking his mind about anything, even if it gets him in trouble. Dorine is Ken’s mother, who owns the family operated grocery store next door to their house. She is a mild mannered and generous person who does not mind watching over Serena until her father can return home. Anna is Ken’s grandmother who shares the same home as Dorine, Ken, and Serena. She’s quite spunky for her old age, and she has a habit of blurting out inappropriate things at the dinner table. It seems such behavior runs in the family. Gale is Serena’s father, who is often away on military duty. He has an arrangement for Dorine and Anna to look after Serena until he is relieved from service. However, with a war going on, that probably won’t be anytime soon. Serena and Ken have a couple other friends who they hang out with. They all go to school together, and they’re all about twelve years old. Since it’s summer time, they spend many of their days playing together in the park. Every good game needs baddies, and in the Prologue chapter we have these suspicious agents roaming around. They’re part of an organization that has been dispatched to hunt down enemy informants living among townsfolk. These two agents will show up often throughout the game to rattle some nerves. On to other news, you may have noticed I added a new banner with some full color art. This was my first attempt at a full resolution version of Serena using the “work from low res and scale up” strategy. I added in detail where it was needed for such close up shots without changing the overall silhouette that I had already decided upon for the sprites. In the comparison between the sketch and the final color version, you can see some differences that I worked out along the way. 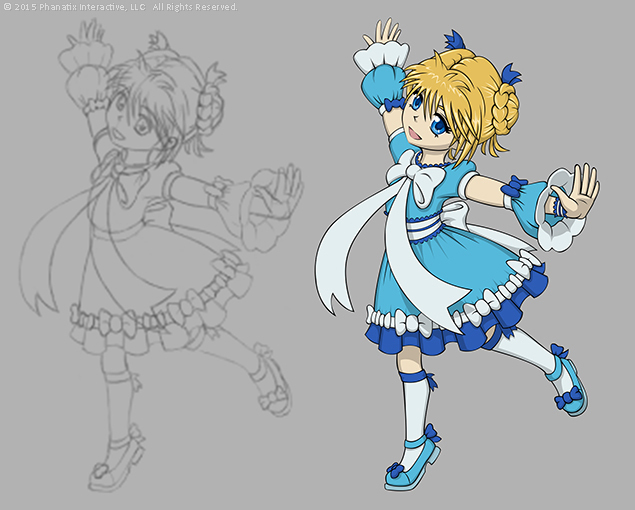 The biggest changes were the collar and waist ribbon that needed some extra detail and color to balance out the design. She also got some wristlets since the arms looked a bit plain at this scale. Less noticeable would be the addition of smaller bows between the larger bows on the bottom rim of the dress. All these little things really make the design pop without sacrificing the sprite design. So you might be wondering if these kind of high resolution versions of the characters will appear in the game. And the answer is yes. I don’t have the system implemented yet, but when you’re going through dialogue sequences there will be high resolution close ups of the speakers while they’re chatting. I’ll be dishing out more details on the portrait system at a later time. So there’s a look at what I’ve been up to. Next, I’ll be going back to sprite duty and finishing up the rest of the NPC sprite designs (the random townsfolk and such). After that, it will be on to cleaning up the level designs.